The love of terrain (common to landscape painters and collectors of desert art) starts in childhood. In my case, ditching high school in the hills of the San Gabriel Valley imprinted me with an ardor for dry ranges. I don’t know if Lou Armentrout and Mick Welch also ditched school, but like me they came to love the land early. In their case: the marshes and fields of Ohio where they both played as boys, and where both later taught school for 30 years. Their childhood attachment to a particular landscape led to a fascination with paintings of the Ohio Impressionists and then–when they moved to Palm Springs in 2006–affection for our own desert canyons. Love one place and you can love another. Lou Armentrout and Mick Welch at home. Photo by Christy Porter. I’d run into Lou and Mick a few times at art events and sensed they were kindred spirits in their fascination with desert painters. But until I visited their home one day I had no idea of the magnitude of their devotion. If you wanted to get to know the Buckeye state, you could read Sherwood Anderson short stories or you could just hang out in Mick and Lou’s living room. After visiting the Midwest, I walked past the dining room table with the Liberace chandelier (purchased from the entertainer’s estate), and turned left into a spacious den. Here were more name desert artists than I’ve ever seen in one room. Mick Welch bid me sit on the sofa as he acted out for me their nightly ritual. While the two watch TV, Mick stretches out his long legs, with the cat Pocahontas (The real Pocahontas was an ancestor of Lou’s) at his feet. Their eyes drift from the small screen across the room and above the fireplace, to a magnificent Jimmy Swinnerton smoketree, with a “burning bush” glow. Next to the Swinnerton they often prop one of Lou’s own works-in-progress, commenting on brushwork during commercials. If they lean back too far they’re in danger of denting a Tahquitz Canyon painting by Carl Zimmerman or another great work of desert art. Should they make a trip to the kitchen for a snack, they proceed past the Gordon Coutts and make a left at the Carl Eytel and Fred Penney. “This is our jewel box,” Mick says of the study with the golden desert paintings on every wall. The collecting started when the two lived in an historic 1930s Greek Revival home in Columbus. In the beginning, Lou collected 18th century period furniture and silver. Paintings seemed out of range for two schoolteachers. “We never thought we could own a painting that was very important,” Lou says. What changed his mind was finding an Ohio artist, Edward Parker Hayden, at an auction for $150. He salvaged the frame from a woman who was going to make it into a mirror. Putting frame and canvas together, he had a start on his Ohio collection. He advises novice eBay buyers to be careful of one-day auctions and no- return policies. And don’t rely on sellers’ ratings because even crooked sellers can finagle 99.6 % approval ratings. After their first online purchase the two branched out to auctions, and soon invested in another important Ohio artist, Abel Warshawsky. From there, the collection grew to the hundreds. Once they moved to the desert, they eased into California art by first buying Ohio painters who came West. You’d think this would be a tiny niche, but actually it’s a sizable club. 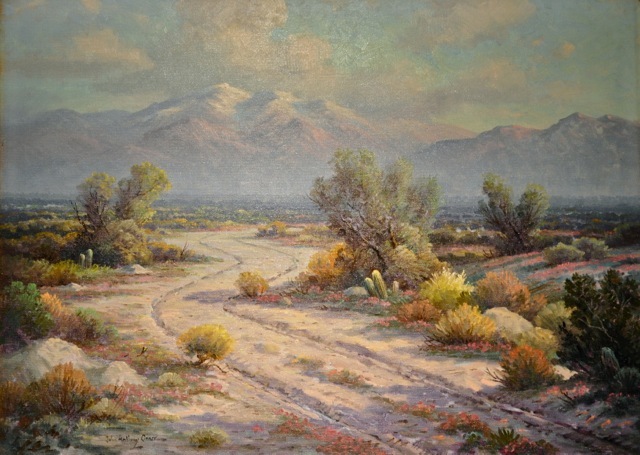 During the April 28th open house, check out the back hallway where you’ll find the substantial subcategory of Ohio artists who westered, as well as a collection of California mission paintings. 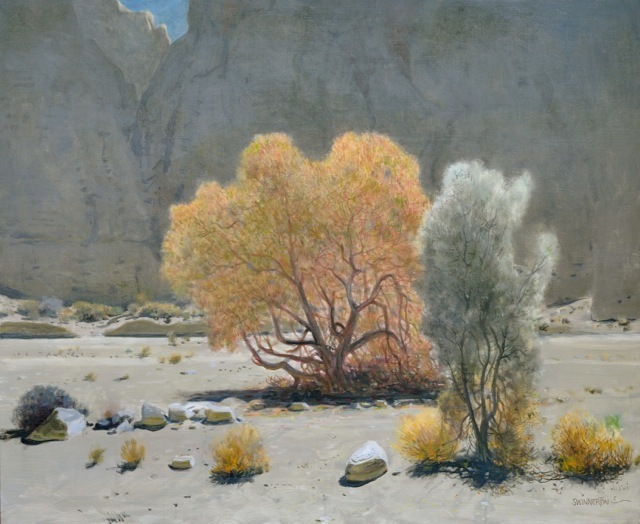 Zeroing in finally on desert painters, Lou and Mick consulted often with respected dealers such as Kevin Stewart, as well as making frequent reference to the two-volume Ruth Westphal guidebook: Plein Air Painters of California, North and South. I spent much of my visit on tiptoe, stretching to see the signatures of paintings high on the walls. These were all desert artists I’d read about: Carl Sammons, Jean Mannheim, Hanson Puthuff, Fred Grayson Sayre, Paul Grimm, Agnes Pelton, Stephen Willard, Conrad Buff, John Anthony Conner, William Wendt, Maurice Braun, Carl Oscar Borg, Bill Bender, Karl Albert, Paul Lauritz–along with lesser-known finds like Vardon Going. 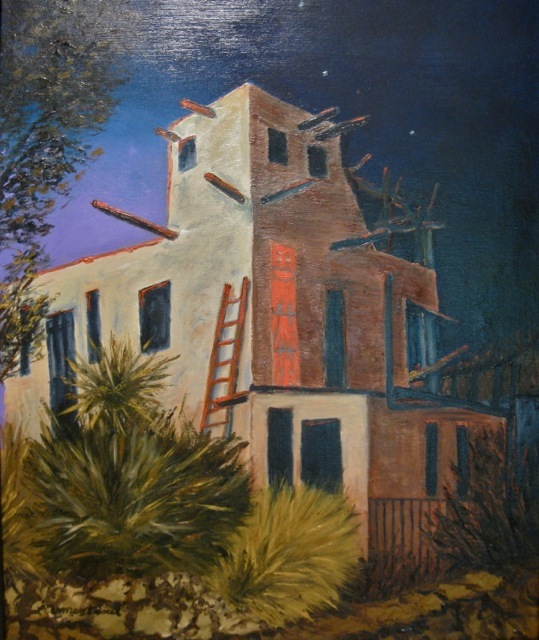 The Gordon Coutts’ painting of Mission Delores was a birthday present for Mick. There’s even a John Bond Francisco, a very early desert painter. Lou and Mick were looking for a William Keith at a John Moran auction when they found this painting. They had to buy it: Francisco is from Ohio. It’s obvious by now that a childhood love of landscape has brought the couple pleasure. But there is more. By a chance connection through a landscaper, Lou heard about an 83-year-old art teacher named Verl Sproul giving classes in her 1000 Palms garage. In the days when Lou was in college, he says, no one was talking about painting the hills of home. It was all abstract and hard edge. “They would have laughed you out of the building if you tried to paint like this,” he says, gesturing toward the desert scenes on the walls. On a lark, Lou went to Sproul’s class, expecting it would be a one-time visit. Three years later, he’s still with her. And today Lou is a painter just as much as he is a collector. Among his recent awards is a “Best Historical Portrayal” in a Desert Hot Springs competition. 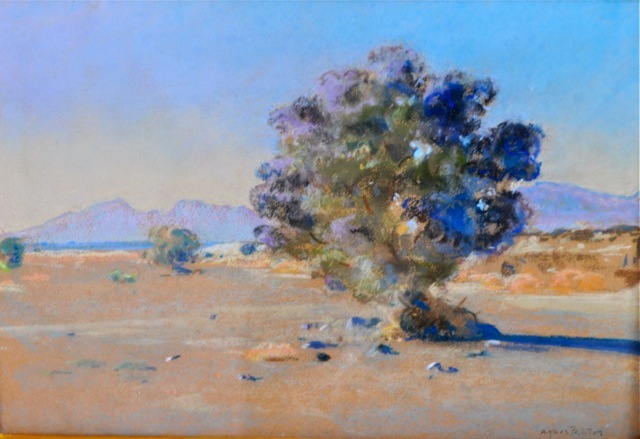 His winning nocturne of Cabot’s Pueblo was inspired by a Will Sparks painting in his collection. The pieces on his walls often inspire pieces on his easel. Currently, he’s getting ready for a show of his California and Ohio paintings at Ohio State University in Columbus. On his kitchen easel is a work-in-progress of a scene he’s painted again and again: the ravine behind his home in Ohio. There may be desert landscaping out front, a golf course out back and Jimmy Swinnerton on the wall–but the heart of this home will always be in Ohio. 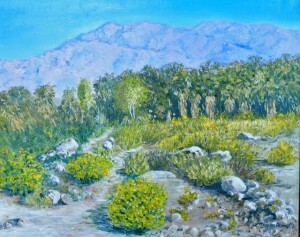 Lou Armentrout painting of his Palm Springs garden. Guys, you have an impressive history of being truly art afficiandos! Oh Lou and Mick!!! I am soooo impressed and wish I could be there to see it all!! GOOD LUCK with your show!!! Hugs!! 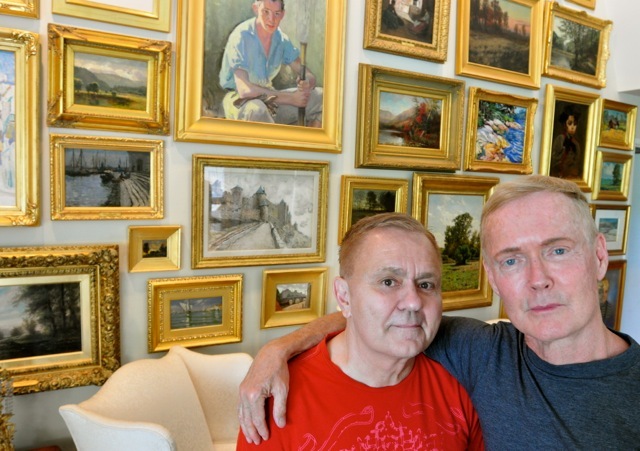 This is a wonderful and well written article about my dear friends Lou and Mick whose art collection is truly inspiring! They are also very generous of their time and passion of art and history. 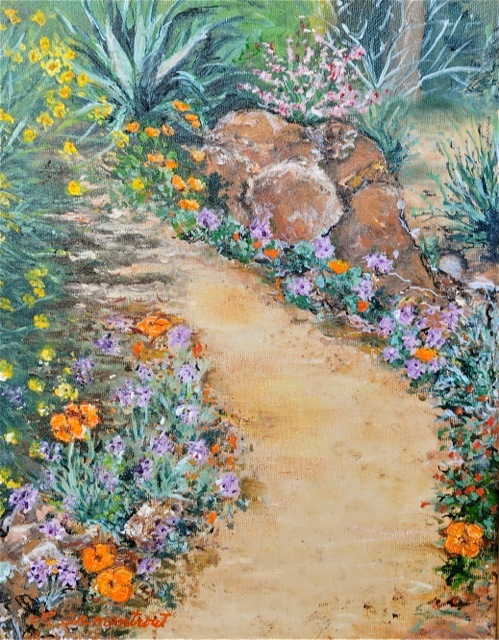 I look forward to joining other art lovers in their home to appreciate their fabulous collection in person. WOW!!!! 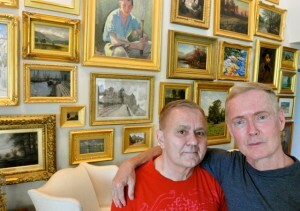 What a great article about your art collection and about the two of you!!! I am so happy that you are sharing your collection and your own paintings by having a tour!!!!! This Palm Springs chapter in your lives is evolving into a prodigious chapter that brings a smile to my face because the two of you are enjoying it so much!!!! Love and miss you both!!! What a treat to see these paintings! Do wish I could be out there to see your wonderful works of art in your beautiful home. Do let me know when you’re going to have your showing at OSU and I will try to come up for it. Best of luck on the 28th! Hi Lou & Mick! It’s on my calendar! Am so excited to see you both and see your beautiful collection. If I may help in any way that day, just let me know. Your collection has obviously expanded!! So good to know 2 Ohio friends are prospering in the west while keeping the heartland with them. Congrats on your show, Lou. What a wonderful article! Your Ohio homes always provided such inspiration. Wish I could see your collection. Makes me miss you both… wish you lived closer. Looking forward to your show in Ohio, Lou. I’m saving money to buy one of your paintings! Wow? The air is becoming very rarefied around you two. You both are getting the due from hard work and dedication. I’m very proud to be your friend. Another inspiring article and a really grand collection! Each accolade just gets better and better. I’m so impressed. I can say I knew you when! Thanks for sharing. What a nice story about two fascinating collectors and their passions! Well done!